Quick update, yes, I have to do chemo. A/C combo every other week for 4 times, and then T every other week for 4 times. More later. I just need to whine for a moment: Anniversaries of traumatic events are sneaky. I finally figured out why last Friday – Good Friday – was so rough for me. 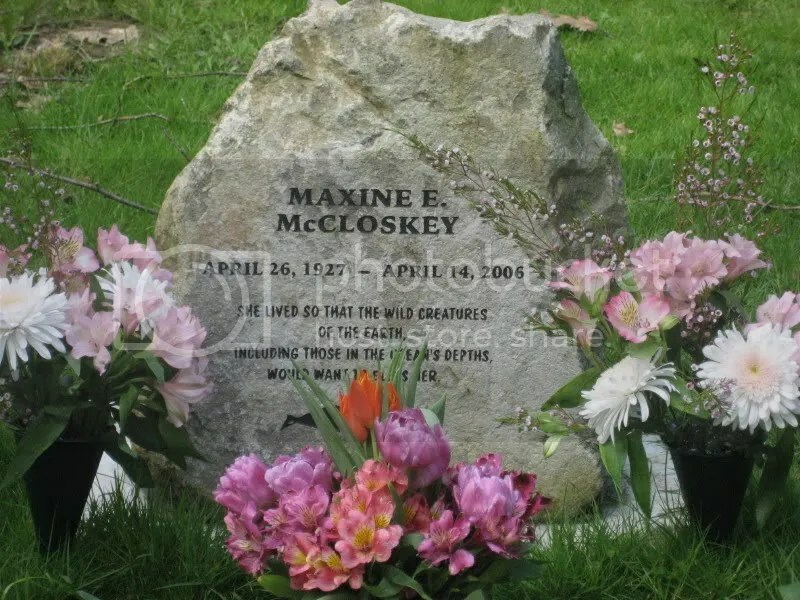 Last year Good Friday was really, really bad – it was the day my Aunt Maxine died. So, in any case this would be a rocky time for me, and it is what it is but sheesh. These days are hard. I know I’ve been incredibly upbeat, however, I’m in pain, I’m grieving her loss still a bit, and then my own losses, I have hot flashes and CHILLS (how come no one told me about sudden-onset menopause and chills??? what the heck? I’m either stripping or putting on a big old parka and a blanket, no rhyme or reason to it) and then I have this meeting about chemo today, and again tomorrow and then a darn big decision to make and somehow it all seems too much. Not fair. I want to say enough already, but I do have this theory about the universe as the giant trickster who likes to “one-up” us, and so I don’t want to tempt fate by issuing any challenges. Ok, officially DONE with my whining for the day!! Bring on that Chemo discussion. Survival stats – check, bring them on. Relapse stats – fine with me. We’ve beat them SO many times with my neice’s health, and with others that stats don’t scare me. Boo. Many thanks to Sam from England for the “Coping with Chemo” book – it was right there on the shelf at my fingerprints this morning when I decided I really needed it. When I was first diagnosed with cancer (two days shy of a month ago, it seems like two years to me), I called my Aunt Nancy. She had invasive breast cancer when she was 38, she’s 63 now, she’s had two recurrences – she’s been through it all. So I really listened to what she had to say. What she said, and I’m just paraphrasing from memory, is that people will come through for you that you never expected. And that some people that you expect to be there for you won’t be able to, so throw your expectations to the wind and open up your arms. Let everyone you’ve ever loved (or even just liked a whole lot) know, and the people who are able to be there for you will be. And so Monday afternoon my friend Jeannie (who lives in Seattle), who I went to high-school with, dropped by, in tears, and hugged me for the longest time. And then we got through the tears and settled down to the business of how the heck am I going to get through this, and came down to the pragmatic: chemo requires that one drink a heck of a lot of water. 2-3 quarts a day. And I had this water filter that I bought a year ago but never installed, so we installed it. 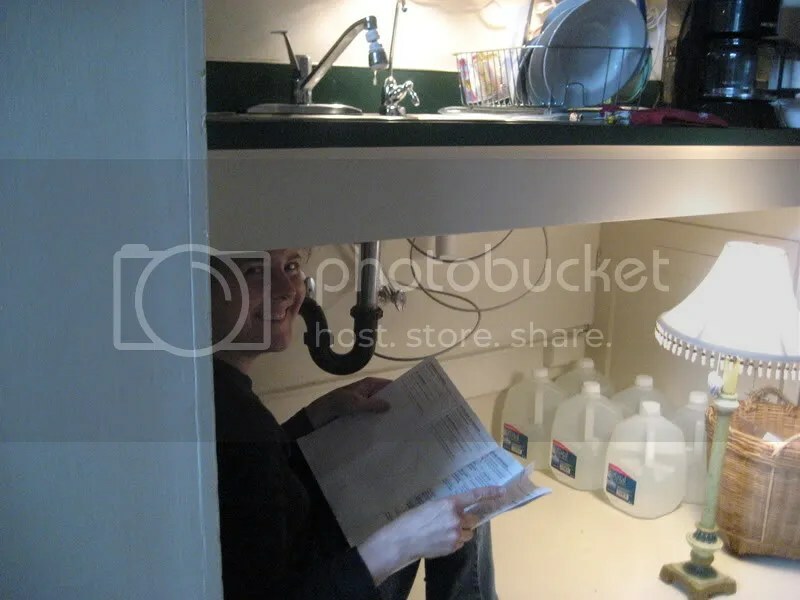 Jeannie and Alicia spent the afternoon hanging out under my kitchen sink. Not what I expected for entertaining guests, but hey, these days are different. LOL. I sat on the floor and read the directions, and a good time was had by all. Here’s a photo of Jeannie watching the finished work carefully to make sure it doesn’t drip -notice the water filter to the right of the kitchen faucet. (Also notice the old system of the 6 jugs of filtered water.) I am one happy camper. Jeannie – thank you so much!! Catching up on recent history, this is the email I started to send out pre-surgery. I never did finish sending it out. “As you know, I haven’t been feeling well for quite a while, and it turns out that maybe there’s a reason for it. Long story short, I have invasive, fast-growing breast cancer. YIKES. I’m sorry to break this news via e-mail, but so it goes. My first reaction was “Holy crap, this can’t be happening!” but I’ve seen the news confirmed 5 ways to Sunday (mammograms, MRI, ultrasound, biopsy, pathology report, 2nd opinion pathology report, 2 breast surgeons, 2 oncologists)….and that cancer has to come out, no two ways about it. Surgery (double eeks) is planned for Thursday Mar 29, but there are still so many test results coming back I don’t know if it’ll happen then, or in the weeks following. Each day is a new day bringing new news, sometimes good, mostly bad and worse. Since the radiologist gave me the bad news on Mar 13, I can’t predict the shape of each day. We know that I have 3 cm invasive tumor in my right breast, surrounded (kind of) by 5 cms of ductal carcinoma in situ. It’s too big of a tumor to guarantee that chemo can save my right breast without deforming it terribly, so off it comes. I know – EEKS. Sorry to be so blunt. I might get it rebuilt later 🙂 🙂 …but that’s 12 -18 months away. Frankly, I’m more freaked out about chemo than surgery, and since I have to have at least 4 months of chemo starting 3-6 weeks after surgery, I don’t want it before hand. Though apparently the good news with chemo these days is that it’s not like in the movies (side effects such as losing hair are not obligatory), and many women go back to work in between sessions (infusions every 2 weeks). So, I hope to keep working, etc. etc. I think my local crew can help around surgery, it’s the 4-6 months of chemo where it gets to be a long haul and my poor family is just going to be really burned out and that’s when I’ll need a lot of support. My parents, and my brother and his wife might need support too, though that’ll be their call. I wanted to let you all know as a group, because these things can be hard, and with us all the same age, it’s been hitting various girlfriends hard. Feel free to share the news if you want – it builds awareness. My cancer was caught on a routine mammogram, which I’ve gotten every year since I was 35. If you don’t do some sort of screening, NOW is the time to start. Tell your girlfriends. Even without health insurance, there are free public health screening programs. If you have questions in the next few weeks, my friend Lizzy here in Portland will be my local volunteer and communications coordinator for the month of April, and when my friend Mariana gets back in May she’ll take that job on. These days I can’t really talk because I’m fielding calls from doctors, but in a few weeks I’d love a call. In the meantime, Lizzy may well be able to get back to you faster than I can. Her email is (ask me). I’ll add you to her “updates about Amanda” email list, but if you’re having a hard time yourself and do NOT want to get email updates, I totally understand, just ask Lizzy to take you off the list. I hope this wasn’t too shocking, I just wanted to let you know. Oh, and not to be scared – survival rates these days are pretty darn good. Gotta love that. For many women this is just a small bump in the road of life. Deep breaths, it’ll all be ok….. This is cause for great celebration, for both myself and my entire family. I do not carry the BRCA1 or BRCA 2 genes! (BReast CAncer gene one or BReast CAncer gene two). The average risk for developing breast cancer is about 12% over a 90-year life span. But women who are BRCA1 or BRCA2 positive have up to an 85% risk of developing breast cancer by age 70. Additionally, women with these genes are at a high risk for ovarian cancer. Normal risk for ovarian cancer is 1.8%, but according to http://www.breastcancer.org, “The lifetime risk is about 55% for women with BRCA1 mutations and about 25% for women with BRCA2 mutations.” Harsh. But I don’t have to cross that bridge, hurray! Now, it doesn’t explain why every woman on my mom’s side of the family has had breast cancer, but I asked the geneticist about that and she said that with the exception of my aunt and myself, the cancers were age-appropriate which sounds horrible to say but it means that those cancers were within the normal risk factors for the age at which they occurred. I hope that’s clear. Also, she said to check back in a few years, as there may be more genes discovered by then that are related to breast cancer. BRCAI and II are just the ones we know about. The stuffing in my post-surgery camisole insert has reduced me to tears. Hallie and I tried and tried yesterday to get it right, to get it to match my left breast and we couldn’t do it, and finally concluded that we needed professional help. So this morning I called the Transitions Appearance Center at Providence’s Ruth J. Spears Breast Center, and was all set to make a joke about being lopsided and lumpy, and just couldn’t do it. Instead I dissolved into an embarrassing puddle of post-mastectomy crying that would rival any 5-year old’s meltdown. The head of the center was very kind though, and patient enough to cajole me in between sobs to explain why the stuffing wasn’t working, and invited me out so she can get me properly stuffed. Lol. They’re not even officially open yet. We all knew the tears were coming, I just didn’t think it’d be over something so silly, a little bit of cotton fluff. My friend David made me dinner the other night and we went for a walk, and the stuffing hurt so I took it out. He said he was proud to walk with me, that I was a one-breasted warrior. And I liked that, a lot. It made me feel like a survivor and strong, and proud to have made a decision to save my life. Guess this is a day to take it easy and chill out…I woke up in SO much pain this morning that I took 2 dilaudid. Lizzy’s on her way though, so we’ll do laundry and play sodoku and take it easy today. One hour at a time. And I’ll stay ahead on the pain meds. And many thanks to Hallie for washing my hair yesterday, I love it being clean, but then I slept on it funny and somehow a bad hair day just undoes me. Maybe Lizzy and I will put it in curlers and that’ll make me feel better. For Erin, if you’re reading this, the pink roses are so, so pretty, and the pin from breastcancer.org just lovely, their website has been such a source of support for me. And Marta, your card arrived all the way from Italy, and I so love it. As soon as I download the pictures from my camera to free up some room, I’ll start taking pictures of all the gifts and cards and flowers that have arrived, as I’m surrounded by loveliness. I woke up this morning and I had forgotten. What a glorious moment that is, the moment before you remember that something world shifting has happened. I wondered why the heck it felt like a Mack truck had hit my chest and underarm. Turns out it had been 12 whole hours without painkillers – thats a loooong time! I am slowly trying to wean myself off of Dilaudid even now (1 week today post surgery! ), but as a friend said last night, if there’s anytime in your life that you should get to take morphine, it’s now. Then I remembered the tumor is gone, and apart from the chest pain I actually feel better than I have for a long time. Naps, lots of sleep, 3 healthy meals and 2 walks a day will do that for you. And no sugar and no alcohol. Plus all the company and support. And the down time. So far so good!